The “chest of the dead” was constructed from mahogany recycled from a long-expired coffee table that belonged to the clientʼs late catholic grandfather. Working for the State Department during the 1940’s, he had commissioned the table while living in Peru and brought it back to the US upon his return. Ultimately, the table was passed on to his daughter and after many years, fell apart. 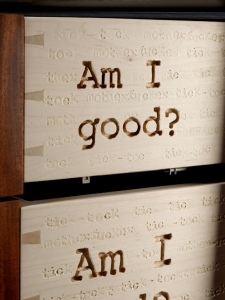 Instead of discarding the material, she wanted to rework the wood into a new piece. Functionally, the design of the chest was born from a need to serve as a dresser base for an old steamer chest that had traveled the globe in the 1920ʻs and 30ʻs with the clientʼs late catholic great-grandmother. In my own travels through ancient latin cultures, Iʼve been impressed by the common inscription, “What you are, we were. What we are, you will be” often seen scrawled around a pair of crudely carved skeletons tucked in the nooks of dark churches. The historical significance of the material and intended function of the piece seemed to beg using this idea as a conceptual springboard to pay a little homage to those that came before. 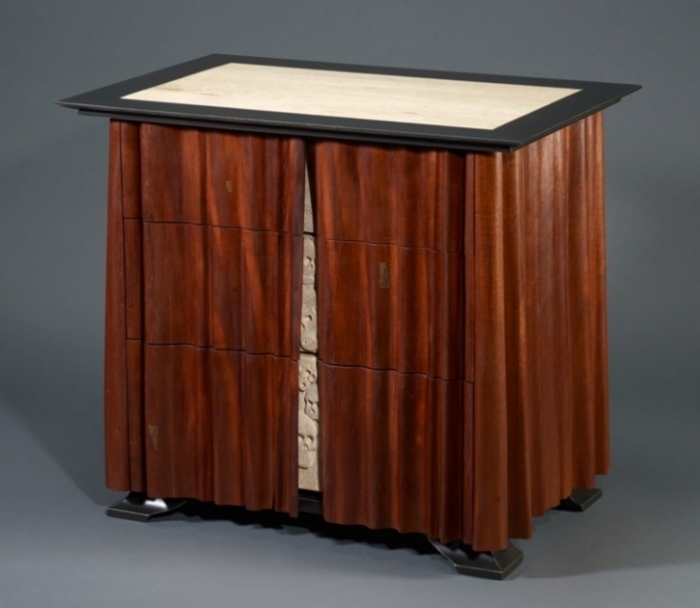 The entire case is made from the recycled mahogany. 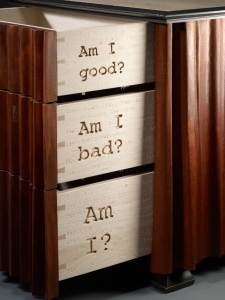 The case is fitted with three maple drawer boxes, which ride on mechanized, soft-closing drawer slides and are carved with iconography inspired by images and musings seen in old catholic churches. 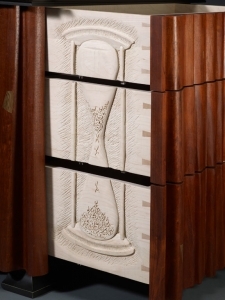 The carved images can only be seen when the drawers are pulled out. The top is made from bird’s eye maple. 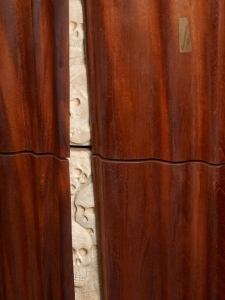 This piece has been exhibited numerous times and won the “People’s Choice Award” at the Master Woodworker’s Show in Knoxville, Tn in 2011.